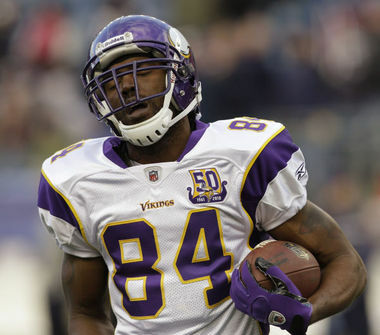 Monday happens to be Randy Moss’s birthday, and according to sources, the former New England Patriots wide receiver is interested in returning to the gridiron in September. However, don’t expect the birthday boy’s wish to open the gates at Gillette Stadium, especially because Bill Belichick or Tom Brady have moved on since his departure in October of 2010. Moss played three seasons in New England before being traded to Minnesota. He played four games with the Vikings, and then was released and acquired by Tennessee. In 2011, the highly touted wide out sat out due to family reasons, but now is determined to make a comeback, and play professional football, again. So, with all this in mind, here are a few thoughts on what teams should acquire Moss for the upcoming season. Buffalo Bills – The Bills have roughly $36 million to spend, so acquiring Moss could certainly help their passing attack, as well as open up running lanes for running back Fred Jackson. New England Patriots – Moss left a sour taste in the mouth of owner Robert Kraft, as well as many Patriot fans because of his postgame rant about his contract in September of 2010. So, I highly doubt that he returns, but knowing Belichick, anything is possible. Kansas City Chiefs – After the way things ended in December and January of this past season, I strongly believe that Kansas City is on the rebound, and adding Moss could help quarterback Kyle Orton. It’s been a while since the Chiefs had a top-notched receiver, and certainly he’s someone, despite being 35-years-old, who could help Kansas City compete in a rather weak AFC West division. Chicago Bears – He’s played a majority of his career against this particular squad, and clearly, the Bears need someone to help quarterback Jay Cutler. The Bears receiving core isn’t exactly the greatest in the NFL, so again, adding Moss could definitely help Johnny Knox and Devin Hester, as well as the running game. The NFC West Division – All four teams, (Arizona Cardinals, San Francisco 49ers, Seattle Seahawks, and St. Louis Rams) have money to spend, and could use a receiver like Moss. The 49ers would probably be ideal for him, but so would the Cardinals. If he lands a job with Arizona, it would most likely help their quarterback find more options. The last unbeaten has fallen. The last winless team is winless no more. Welcome to “Upset Sunday” in the NFL. With all the hype surrounding the Patriots/Broncos epic matchup in Denver, the first big headline of the day came from Arrowhead Stadium. The Kansas City Chiefs, who fired head coach Todd Haley less than a week ago, pulled off the shocker of the year: a 19-14 victory over the previously undefeated Packers. Kyle Orton threw for 299 yards – 64 more than Aaron Rodgers. Jackie Battle scored Kansas City’s lone touchdown of the game to seal the deal. Rodgers pulled Green Bay to within five in the closing minutes, but the Chiefs were able to run out the clock. The end result: the Packers’ first loss since Dec. 19, 2010, and a Gatorade bath for interim Chiefs head coach Romeo Crennel. The Packers still have the inside track to the No. 1 seed in the NFC, but Sunday’s result gives other teams hope. Meanwhile, at Lucas Oil Stadium, another long streak ended. The Indianapolis Colts finally won a game. With a 27-13 victory over the Titans, Indianapolis avoided becoming the second 0-16 team in NFL history, (Detroit is alone in that regard). The Colts’ defense forced three turnovers, and Donald Brown rushed for 161 yards, including an 80-yard touchdown in the fourth quarter that sealed the deal. Indy’s defense held Chris Johnson to just 55 yards on the ground. While those were the most notable upsets of the day, they weren’t the only ones. The Panthers beat the Texans. Houston was one of four teams that came into the day tied for the No.1 seed in the AFC. The Seahawks beat the Bears at Soldier Field. Chicago hasn’t won since losing quarterback Jay Cutler to an injury. The Redskins walked into the Meadowlands and put a dent in the Giants’ playoff hopes. 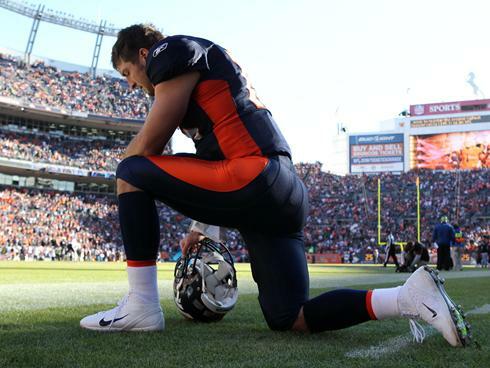 NBC’s Saturday Night Live performed a rather intriguing, as well as exhilarating skit on Saturday, Dec. 17, about the Denver Broncos quarterback, Tim Tebow. To watch the skit — CLICK HERE.